Welcome to our Prague Guide. You can find information about the major sights, museums, restaurants, transportation and other useful information, regularly updated and expanded. 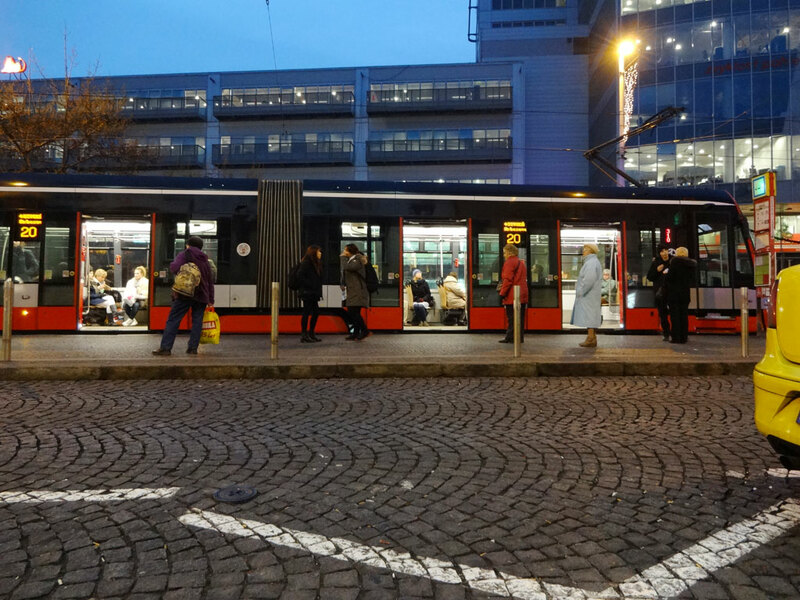 Prague has one the best public transit systems in the world when it comes to reliability and efficiency. 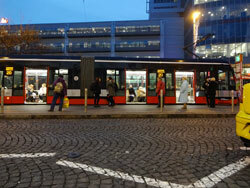 The main mode of transportation is the Metro with three lines (A, B and C), the streetcars and buses. For touristic purposes, the streetcars are the most common way of moving around and one of the best lines for sightseeing is number 22 that operates through the Mala Straná and the castle on its way through the center. Many of the key attractions are located along its route, which make it convenient. One of the best things to do is to ride different streetcar lines in order to see how the city looks like outside of the typical central areas, which also allows for some spectacular views such as those offered by line 10 and 16 between the Biskupcova stop and Palmovka metro/streetcar station. On this section, a wonderful panoramic view is provided, which stretches to the Prague castle and the Petřin hill. Another view with some environments looking like they were taken from a fairy tale can be experienced by taking the streetcar up to Barrandov, the film industry part of the city, which also provide elegant villas even if a lot of apartment blocks has been added during the 70s and 80s. 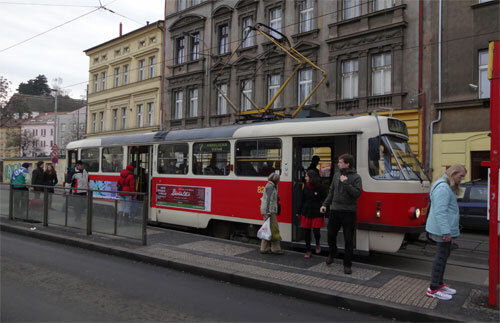 Prague offers many different environments and a sightseeing trip with one of the streetcar lines give a great glimpse into the everyday life of the people. It is also recommended to stop by a restaurant mainly frequented by locals on such a trip in order to experience a different atmosphere and style of life than what the city center provides. The Metro provides fast transportation in the city but is strictly underground; no over ground lines exists beside the sections on the B line in a glassed tube after Nove Butovice to Lužiny and Rajská Zahrada to Černý Most. Despite this, it is worth to take since the stations offer a modern styling and a clean environment. The first line was the C between Florenc and Kačerov, which were inaugurated in 1972. Its station are built with high quality materials such as marble and give an insight in the achievement made, especially since it also resulted in the creation of the bridge over Nusle and heavy cut and cover work in the city center. One less fortunate factor was the introduction of a highway straight through the city but that mistake is on its way of being rectified with the brand new Blanka Tunel, which will change the environment for the better. 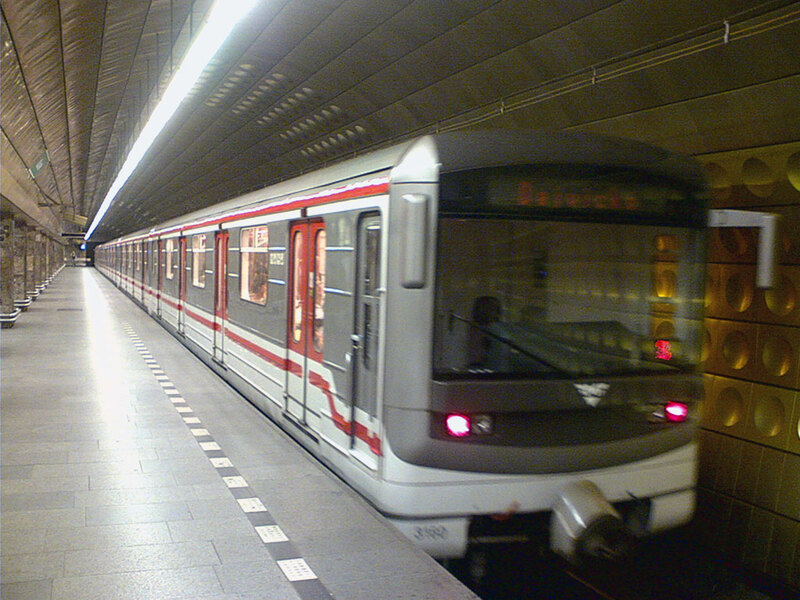 For tourists, the A line is most common since it provide transit between the central areas such as Vaclavské Naměstí and Mala Straná; it is a popular route to the airport as well (by taking the Metro to Dejvická and bus 119 onward). The bus network is excellent and dedicated to suburban service; the streetcar is the main mode of transportation in the central areas even if a few bus routes such as 135 and 176 operate there as well. Tickets are to be purchased before boarding a vehicle or entering the designated area of the Metro stations. Single ride tickets (60/90 minutes validity) can be purchased through vending machines, kiosks and Trafika stores (tobacco stores) and other places and are fine for limited rides but day cards (1, 3 or 5 days) are usually a better option for the stay since they can give a decent saving when a couple of rides are taken. A few years ago, the prices were increased dramatically and the previous 7- and 15-day cards were removed and replaced with the new 3- and 5-day ones. At the same time, prices went up and the new 5-day card is more expensive than the old 15-day; something that make it interesting to purchase a monthly card instead. Such a card can be obtained through the customer service of DP Praha and give unlimited rides for 30 days at a price just marginally higher than the 5-day card. If a stay exceeds five days, it make sense to get one of those, especially if we are talking about ten days or similar, where two 5-day cards would be needed for full coverage. Frequent ticket controls are being performed and the fines are steep; make sure to have a ticket and buy a card preferably since those needs just one validation, which means less risk for missed punching and extra surcharges in case an inspection is being performed. One very important thing to do is to get a route map with re-routings. Track works occur, especially during the summer and means streetcar line changes and also the introduction of special operation with numbers in the 30 series. Those changes are announced on the DPP website, in the Prague Post English language newspapers and at the stops and customer service centers. Updated maps showing the operational network with re-routings are always available at the Metro stations with customer service kiosks and are a great help since it can be confusing otherwise, especially when a special one replaces a regular line. Prague is a city with two distinct price levels: touristic pricing and local pricing and the difference between them is substantial. One example is restaurants where typical establishments for foreigners can charge 300-800 CZK for a meal while a similar styled local place can provide an identical dinner for 150-250 CZK. In some restaurants, a main course can be ordered for around 80-100 CZK compared to the 300-500 CZK it can cost at the tourist place. Restaurants in Prague 1 are mostly geared toward foreigners and charge high prices. The value proposition can be discussed and a better option is to look for upscale environments targeted toward the wealthier local population instead since they give better cuisine to similar prices. Examples of such places are the Francouska Restaurace Art Nouveau or La Perle de Prague (in the Ginger & Fred/Dancing House) or the fine Italian Ostroff restaurant. By going to those, a luxurious dinner can be experienced to prices that provide value for the money. Regular meals can be enjoyed at local restaurants and those can be found not far from the touristic areas. By moving from Prague 1 to Prague 2 (Vinohrady), many decent restaurants with local customers can be found and they offer decent food and a non-touristic environment, thus providing a glimpse of the everyday life of people. Similar pricing strategies can be found at the museums; the more specialized ones are less frequented by tourists and offer lower admission fees than the Prague Castle as one typical example. This also means that a lot of culture can be experienced during a stay, while offering a great value as well. In the case of shopping, a special situation has been created after the velvet revolution. Almost all shops in the Prague 1 area are strictly geared toward tourists and the selection is a bit monotheistic with Change and Bohemia Crystal/Souvenirs almost everywhere. Other products such as clothing, groceries, books, music, furniture and everything else are to be found outside of this area; it is necessary to move to Vaclavské Naměstí and Na Příkopě in order to start finding the variation. Before the system change, other shops such as groceries and hardware stores were available in the touristic area but were forced out in order to make space for all Change and Bohemia Crystal/Souvenirs. An example of this was the U Rotta building where a hardware store existed for a very long time before it was converted into a department store for crystal products. Because of this, a visit to the shopping malls and exploration of the other parts of the city is highly recommended since it paints a completely different picture, both of the selection of goods but also the general price level, which is attractive when moving to different areas. Even for typical gifts such as crystal, it is worth to detour out of Prague 1 and to check the malls since the selection is decent paired with a better value proposition. Prague is a safe city, generally speaking even if crimes occur. In the case of visitors, the typical things to look for are pickpocketing, which can happen on the Metro or the streetcars. It is always recommended to keep the wallet safe, especially when traveling through the tourist areas. If there is special call-outs onboard the streetcars (beside the regular announcements of the next stop and so on, be on the watch since those usually is a heads up about the need for increased attention). Those announcements are usually made on the line 22 from Malostranská up to Karlovo Naměstí since it is a section often frequented by visitors. It is also important to avoid black cabs or to take cabs near the Charles Bridge and similar locations. Licensed AAA cabs or hotel cars are to be used rather than “nameless” ones, which can be operated with very high fares by shady drivers. It is better to arrange transport from the hotel rather than trying to take the “first” cab on the street. It is recommended to use GPS and a mobile device with appropriate informational apps in order to navigate the city. Some museums provide apps as well, which can give a better understanding of the different artifacts and also stimulate further studies before or after the visit. Prague is very pedestrian friendly in general but some parts of the old town can be quite tricky to navigate, which make a digital map helpful. Another thing that is highly recommended is to use apps that use the camera of the device in order to identify and provide information about different buildings, which can be a fun and interesting way of learning more by seeing and doing.